With the second wave of Necrons finally here, I had an idea to use left over sprue to make a base with some Necron type crystals on it. 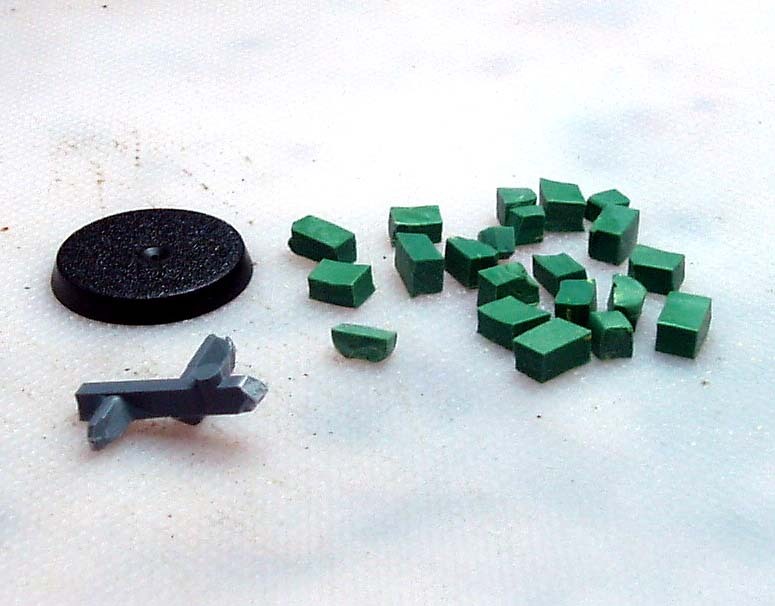 To start with, take your standard base and grab a few pieces of left over sprue. I like to use smaller pieces for smaller bases and bigger pieces for larger bases. 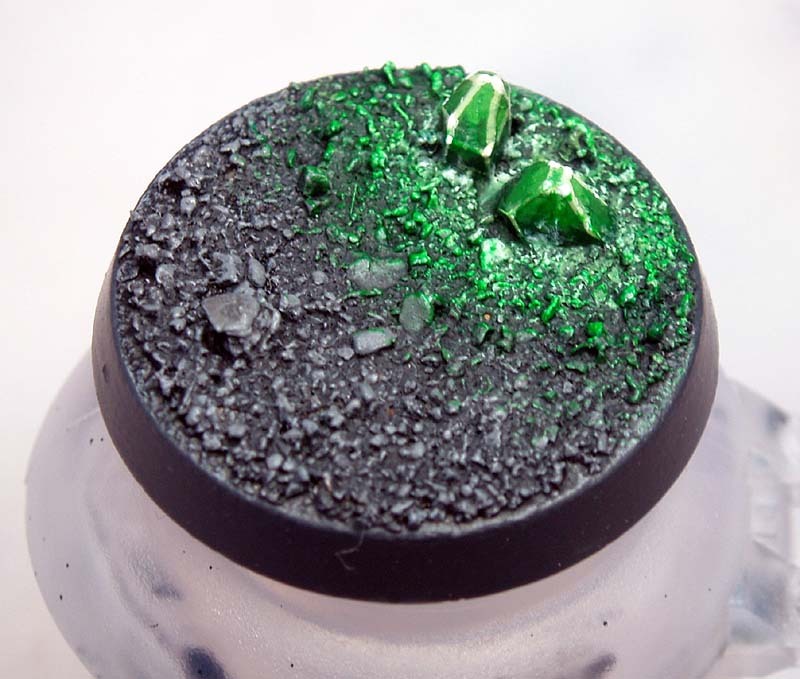 You can also use left over greenstuff for the crystals if you press it into small bricks before it cures. 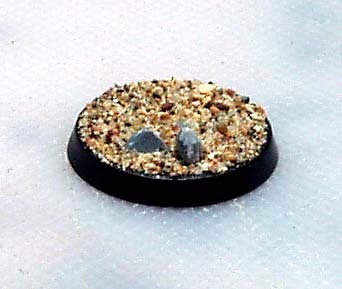 I do this with my leftovers and then have it to use as rubble on my other bases. Take your sprue pieces, cut them into various short lengths and shape the top end into a crystal like structure. It doesn't have to be perfect, a series of angular cuts that taper to a point are all you need. Now use PVA glue to stick your sand on. Undercoat with black, in this case Chaos Black. I went for an 'ash waste' type world, so I used a progressively lighter shade of Chaos Black and Codex Grey to highlight the sand area. I then painted the crystals with Dark Angels Green. Here I used a mixture of Goblin Green and a small amount of Bubonic Brown to highlight the crystals. To bring out the details I used the lightest mixture to hard edge the sides of the crystals. After that I mixed in some Bleached Bone and applied this in small dots to the corners of the crystals only. I also wanted to create an area on the sand that was 'Glowing' from the reflecting light coming from the crystals. To do this I started with a heavy wash of Thraka Green. Then once this was completely dry I drybrushed Skull White over the area concentrating more on the area closer to the crystals and fading away the further you move away. Finally another wash of Thraka Green on the furthermost edge of the 'Glow' effect and pulling it in towards the crystals to blend in the transition from light to dark. Do you paint your bases before or after your model? Sprues make great rubble in terrain. I have a whole box sitting aside for just that use. I will be sending this to a friend! Nice work Vitor and thanks Ron! Andy - bG: That's actually a great idea for markign squads and not making it obvious. Very cool! Perun: Yes indeed, another use for sprue. Perhaps one of the most versatile conversion bits out there. Fayte: Excellent, please do pass it on. Heres a tip for making rubble quickly...Use an old style metal sausage grinder to take old sprues and grind them into rubble for city fight terrain. Works really well but you can't ever use the sausage maker for anything but rubble so buy it second hand if you can. Its cool cause you can churn out piles of rubble in mere minutes which was great because i was doing a whole table of terrain and didn't want to get carpel tunnel from using my sprue cutters a million times. Crystal are indeed great fun to make and add to bases. They also work with a lot of different minis and games as well, not to mention it can real spruce up your force at zero extra cost. Zab: I've heard of that before, but never had anyone actually say they do it. Hephesto: Nice work, I like the different color choices as well. You don't see that often. been using a similar technique on my skaven for many years. 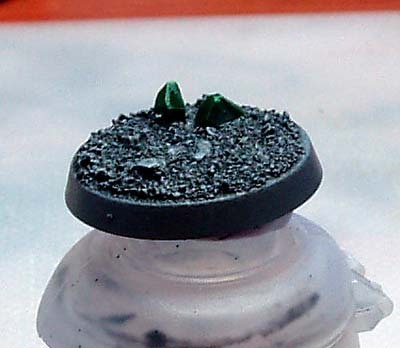 if you swap the green for blue, it makes for a nice ice effect for space wolf bases too. I can't believe I never thought of this. 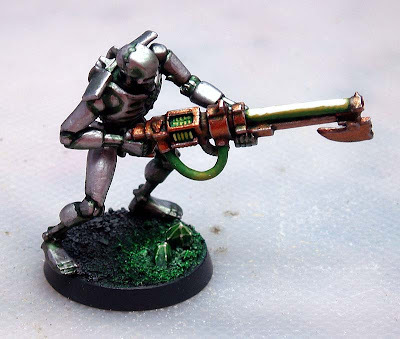 I'm so glad to have about half an army of Necron infantry left to base to try this on. Thanks for the post, Vitor / Ron. Renfield286: Good point. Hephesto did something similar on his bases in his blog post with different colors. Ant: There you go and you can use them as a subtle way to mark your different squads as well.